Asitha Samaraweera, a TMC member, will talk on the rapidly changing international business environment, technological disruptions, mindset of the emerging consumers and how we must look at business differently. He will also draw on his international exposure to talk about how Sri Lankan managers can develop their management skills. Asitha currently is the Managing Director of Atlas Axillia Co. Ltd., a Hemas Holdings Group Company. Atlas Axillia Co. Ltd. is one of Sri Lanka’s most respected local brands and is a market leader in school stationery and notebooks, pens, pencils and colour products, with products retailed in over 70,000 outlets across Sri Lanka. Before his current role, he counts over 12 years’ experience in leading FMCG businesses both in Sri Lanka and overseas. 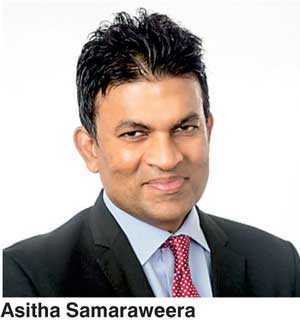 Asitha was the CEO of CBL Cocos Ltd. and CBL Global Foods, both subsidiaries of Ceylon Biscuits Ltd. before joining Atlas Axilla. The company was a leading player in the coconut products industry with a substantial export interest. Prior to his role at CBL, Asitha headed IFFCO (Frozen Foods) and GFI – leading Dubai-based FMCG companies for six years. The two companies are leading processed meat and frozen bakery product manufactures in the Middle East. Asitha began his career with Nestle joining as a management trainee and rising in the ranks in the marketing arena. In his marketing career he was involved in many successful campaigns which included the Nestomalt’s defeat of Powermalt which is now a well-known case study. He has a background in marketing with an MSc in International Accounting and Finance from the London School of Economics, one of the leading universities in the world. He also has a BSc in Business Administration, Washington University, St. Louis, MO, USA. This presentation will be held on 18 October at 6 p.m., at the Galadari Hotel. All members are welcome to listen, learn, enjoy, interact and network. Members may bring guests who may be interested in joining TMC. Rs. 750 will be charged for light refreshments and drinks.